Pam Bass (second left) presents Tania Dwyer, Neil Morrison and Murray Fraser with the Pup Cup and prizes for finishing first in the 4x50m relay on Sunday. Absent was fourth team member Brendan Hayes. Over $1800 dollars was raised at the auction held at the Golf Club following the swim. Warm temperatures and the promise of a fun, family day drew about 100 swimmers to the Forbes Pool on Sunday. There were 20 teams contesting the 4x50m freestyle relay and annual trophies presented to the best junior and senior swimmers. The winners of the relay (pictured above) finished with a time just 0.24 sec outside thier nominated time. In second place, 0.4 sec outside were Richard Barwick, David Dwyer, Murray Fraser and Brendan Hayes who backed up to swim two legs. Third were G. Field, T. Field, G. Percy and S. Percy, 3.0 sec outside. Junior 30m - 1. Shane Percy (0.25) 2. Tamara Maitland(0.30) 3. Kaitlan Faulkiner (0.50). Senior 30m - 1. Anthony Rennick (0.20) 2. Norm Cook (0.22) 3. Paul Faulkiner (0.22). Junior 50m - 1. Paigan Bartholomaeus (0.19) 2. Ryan Shatz (0.20) 3. Amelia Sweeney (0.29). Senior 50m - 1. Mark Stibbard (0.06) 2. Michael Bushell (0.07) 3. Michael Ryan (0.09). GEOFF WATSON - HE'S STILL GOT IT! Seventeen swimmers from Forbes travelled to Wellington for the Western Districts AIF Championships. A good time was had by all and there was also some success in the pool. 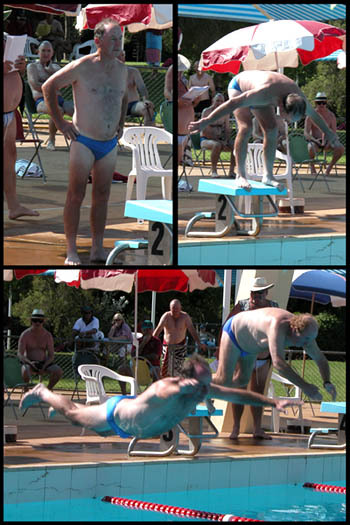 Geoff (Pin Head) Watson made a return to the pool and came third in the 50 metre RSL Championship. Geoff was happy with the result and let everybody know at the Wellington RSL when he was awarded with his trophy. Forbes also picked up 1st place in the 6x50 metre relay. This is the first time the trophy has traveled back to Forbes since 1974.